Growing Onions. 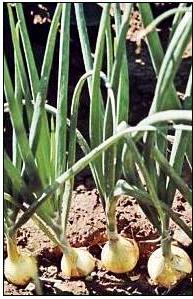 How to Grow Onions with Tips, Pest & Disease Control. Growing onions is a must. What kitchen on earth can run without onions? They enhance our dining pleasure... fairly reeking of charisma and pungent character. Regardless of its different varieties, all onions belong to the genus Allium. This page is about the dry bulbing onion species, Allium cepa. Other onion species are leeks, scallions, garlic and shallots. Onions are bi-annuals, flowering in their second year, although most gardeners grow onions as annuals. Onions are highly regarded for their therapeutic value, being rich in sulfur which also causes the pungent aroma. They contain chromium (helps cells respond to insulin), vitamin C and numerous flavonoids, including quercetin. They are good for the heart and keep cholesterol in check. Gardeners in Asia and the Middle East were growing onions over 5000 years ago. From ancient times the Egyptians cultivated onions extensively, in fact using the onion as currency to pay the workers who built pyramids. 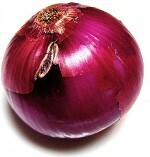 Evidence shows that in India, from the 6th century, onions were used as medicine. The Greeks and Romans held the amazing onion in high regard. 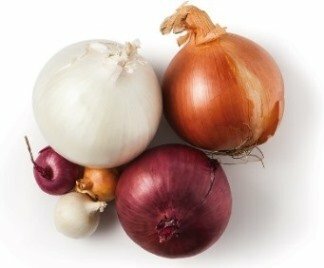 There are mainly two types of onion, which are then further categorized, but here we'll look at growing onions of the dry or bulbing type, which have yellow, white and red colour varieties. Onions are as hardy as they come and are regarded as a cool season plant but will grow well in a wide range of temperatures. Even young plants don't mind frosts or snow; although -5°C (21°F) temperatures for months on end will more than slow their growth... it will kill exposed onion plants. The best temperatures for growing onions are from 13-25°C (55-75°F). They produce higher quality bulbs if the weather is cool during their early growth stage, then they like increased temperatures for optimum maturity. When in full growth, onions like 6 hours or more sunlight most days. The cultivation of onions is very interesting due to the technicalities involved. The bulb of the onion is formed of fleshy and enlarged leaf bases or scales. The hollow green leaves develop in a sequence from the meristem, which is the innermost portion of the base of the bulb. During the vegetative growth when just green hollow leaves are growing, the middle flowering stem is tiny and insignificant. This changes if the onions are not harvested and left over winter to produce seeds. After vernalization (period of cold) at temperatures below 10°C (50°CF), the middle flower stem grows very fast and produces compound umbels — those attractive circular flowerheads. It is believed that the length of the day as well as temperature affects bolting. Long days actually accelerate development of the seed stalk once it has been propelled by vernalization. Sow or plant onions to avoid frost so that they grow without any setbacks. Planting onions is best done when the last frost in your area has (hopefully) been sent packing by spring. Growing onions over summer means you will harvest as summer closes. In mild and warm areas you can plant onions in late summer and autumn/fall for a spring harvest. •	The traditional garden onion is referred to as "long-day" and needs at least 15 hours of daylight with good sun. The long day onion varieties are best grown in colder growing areas. 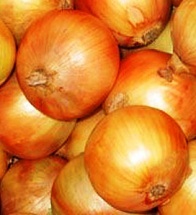 •	There are "intermediate-day" onion types needing only 12-13 good daylight hours to stimulate the formation of bulbs. 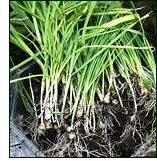 •	More recently "short-day" onions are happy to form bulbs after 9 hours of bright daylight. These types are good for hotter growing areas with mild winters and can be planted in late summer and harvested the following spring. When it comes to choices we tend to go with the easiest, but with gardening it often proves better to put in a bit more effort up front to get superior results. You can buy a packet of onion seeds and sprinkle them down a few rows, thin out the seedlings and eat as green shoots, then let the rest bulb up and hey presto — nice, fat onions about 5 months later. Buy onion 'sets' which are small onions, and you plant each bulb nicely spaced from each other. Of course this method is the hardest, most expensive but produces onions the fastest. 1. Indoors: You can get a 2 month start by sowing your onions into seed trays, in a hothouse or on a sunny windowsill or using a heat lamp or heat pad. Use an organic seed raising mix and keep them constantly damp. When there is no sign of frost and your green shoots are thin pencil size, harden them off by gradually exposing them to outside weather over a week, then finally transplant outside to their permanent growing patch. 2. 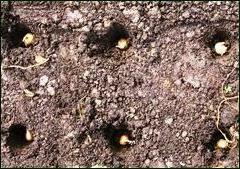 Outdoors: Onion seeds will germinate in around 2 weeks when the soil temperature is 10°C (50°F). At 24°C (75°F) and above seeds will only take 3-5 days to sprout. 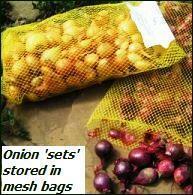 Sowing onion seed outdoors under cloches or polytunnels can be done 2-3 weeks earlier with this added protection. Sow seeds 2.5cm (1") deep and spaced roughly 2.5cm (1") apart. Space the rows or double rows at least 50cm (20") apart. At any stage, but usually when the shoots are pencil thickness and before bulbing, you can carefully start thinning out the young onions shoots to use. 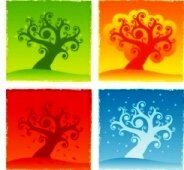 Depending on the variety, allow room for growth between each seedling. For average garden storage onions, the spacing should be 7.5cm (3"). For varieties like pearl onion, reduce spacing to about 2.5cm (1"). 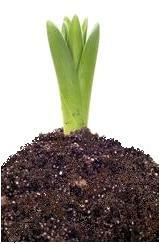 For large bulb sizes the spacing should be 15cm (6"). For the very best onions grown for storage, plant out onion seedlings. When you're sure the last frost has gone to the other side of the world, plant out your seedlings following the same spacing information as for seeds above. Look after them well so they have no set-backs and grow strongly. There's no reason why you won't then have beautiful mature onions to store and use for meals right through the winter. Sets are onions that were planted from seed last year. You can grow you own and save the sets from the previous year or buy onions sets ready to plant. If you grow your own onion sets, pack them in the soil like a crowded lift, so they can barely breathe and they only produce little bulbs. Then harvest them, store and plant the next season. Onion sets for planting should be like firm marbles with no sign of sprouting yet. They like cool conditions when first planted and warmer later when maturing. Once in the ground... and they don't mind frosty conditions of 5°C (41°F) up... they shoot away and produce nice fat onions, although these are less likely to store well than onions grown from seeds or seedlings. You can even speed this process up with a super early start by putting sets in moist seed or potting mix several weeks before they go outside in a not too warm place, but warmer than outside if the ground is still frozen. These onion sets will send out good strong sprouts and roots, then you can carefully transplant into the garden. What you do want to avoid though, is onion sets that have started to sprout and root whilst in storage and they are soft and sad looking. Any sets that are too large or already sprouting will be prone to splitting or sending up an early flower stalk. Once an onion has decided to flower it might look pretty but it won't grow larger, so eat these ones first. Even large sets that don't go to flower early should be used for picking the leaves to be used like spring or green onions. Poke in each bulb with the pointy end up approximately 4cm (just under 2") deep, or make furrows and place bulbs in rows then cover with soil and firm well as this helps deter the onion fly. Remember, doubtful onion sets can still be planted, but stick them in touching each other so they don't need room to bulb up and you can pick green onions from them. Otherwise allow a good 8cm (2½"), depending on variety, between each bulb set. Onions have soft roots so dislike heavy soils. The soil has to be well drained, friable and fertile for growing onions. Soil pH should be 6-6.8. Onions love lots of old manure and compost mixed in for several weeks before planting. Because onions have slender leaves and don't block much light, the surrounding space between each onion plant receives lots of sunshine which encourages weed growth and allows weed seeds to blow in and thrive. Keep the area as weed free as possible and don't disturb the onion roots when weeding. Also don't grow plants with aggressive roots nearby. 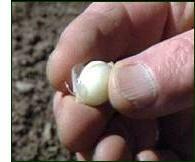 When growing onions they need uniform moisture throughout the season, otherwise fully formed bulbs will not be produced. 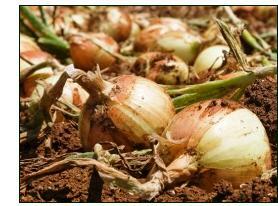 If you have heavy soil and let it dry out, it could crack and damage the onion bulbs causing distortion. Feed an organic fertiliser every 3-4 weeks during growing and bulbing stage. Once the bulbs are mature, hold off any irrigation or feeding to allow the bulbs to dry and harden ready for use and storage. As well as growing different onions for their yields and usage, there's also a range of shapes and sizes. The bulbing or dry onion varieties can also be roughly categorised into spring/summer types and autumn/winter types. Spring/summer onions have a suburb sweet flavour. They are planted in warmer parts of the world around autumn and grown over winter then harvested as they become ready in the warmer weather. With a high sugar and moisture content, sweet onions don't store for long. They are often eaten raw or gently stir-fried. There are many heirloom and hybrid sweet onion varieties — too many different names in different countries to put them all down here. Well known varieties of sweet onions that have been around for a long time are Yellow Granax which is popularly known as Vidalia, Spring Sweet, Bermuda, Sweet Spanish and Walla Walla. Autumn/winter onions are usually planted in colder parts of the world around springtime, harvested in autumn and store well through winter. These onion varieties are then available throughout the year because of their good keeping qualities, being low in moisture and high in sulphur. They give a pungent, flavourful boost cooked with other foods. A few varieties are Boiling onion, Shallots and the Spanish onion. However, the Yellow onion has the longest shelf life. 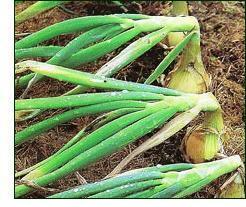 When growing onions even the dry bulbing varieties can be eaten green like spring onions, before they produce bulbs. Red onion: A sweet, short storage onion, often eaten raw. 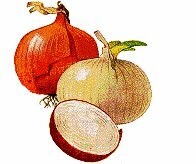 Vidalia onions: A large, sweet and mild onion. Really a Yellow Granex variety, but onions grown in the low-sulphured soils of Vidalia US are particularly sweet and are allowed to be called Vidalia onions. Red pearl and White pearl onions: Small, sweet and great for pickling and boiling. Cipollini onion: A mid-sized, flat onion, good for cooking. Yellow/brown onions: The most common onion for cooking and great long storer. 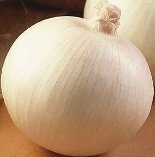 White onions: A popular cooking and storing onion, slightly milder than yellow onions. Egyptian walking onion: A weirdo but popular. Has underground bulbs which have a strong, unpleasant taste so only the clusters produced on the end of the stems are used. Often the tops bow over with the weight of the bulbs which take root in the soil to grow more onions, thus 'walking' over the garden. 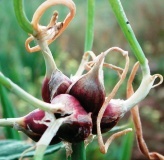 Click to read about Growing Shallots. Your growing onions are nice and fat and raised slightly out of the soil... then you notice the leaves starting to turn yellow and even some fall over. That's a sign the onions are mature and almost ready to harvest. For long storage onions the onion tops should be manually broken over to speed up with drying the necks before harvesting. The back of a rake is a handy garden tool for doing this. Basically, by bending the leaves you're stopping the leaves growing further by cutting off the flowing sap and instead diverting all the plant's energy into the maturing bulb. At least fifty percent of the tops must be broken over before harvesting storage onions. When growing onions for immediate consumption, they can be harvested with about 20% of the tops broken over. It takes roughly one week after the tops are bent over before they have withered and turned brown enough so you can lift out your onions. 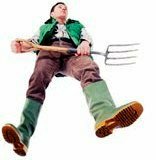 Use a garden fork or suitable tool to carefully get them out of the ground. The onions can be left in the open sunlight for a few days to dry the necks and tops. This is not recommended for searing hot sunny areas as the onion bulb may get damaged due to direct contact with the sun light, so use a shady but airy area — unless of course you can keep the bulbs partly covered by the drying leaves. Many farmers "shingle" their onion rows to stop sunscald. They simply bend over the tops of one row to cover the bulbs of an adjoining row. You may also need to brush, wash or hose off clinging soil before you leave them to dry. Remember that any damage to the skin when harvesting onions or drying them off can provide access to organisms resulting in rot setting in and ruining your store of onions down the track. Unless you are going to braid your onions, cut the tops off leaving about 2cm (just under 1") and trim the roots closely. Leave to seal and dry another couple of days. Store onions in a coolish, airy, dry place, preferably on flat trays or shelves, or hung up braided or in mesh bags. 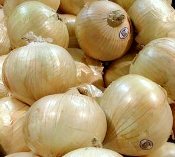 If you get your growing onions, harvesting and storage done right, there's no reason why the bulbs will not keep almost indefinitely, at least for the firmer long day varieties. Before storing onions, a process of curing needs to be undertaken. The precise purpose of curing is to ensure drying and dormancy. Fully mature onions are cured by exposure to approximately 35°C, with less than 50% humidity. At curing stage, the air movement should be allowed at the rate of 1 cubic foot/minute/cubic foot of onions. Immature onions necessitate twice the rate of air exchange. After curing, the temperature should be lowered to 0°C gradually. The relative humidity should be 60-70%. To prevent condensation on the bulbs, air exchange is very important. When the bulbs are removed from storage, they should be conditioned for several days at 20-50% relative humidity. Depending on the onion cultivar used, the freshly harvested onions remain dormant and do not sprout. At storage stage, sprouting occurs, when the storage temperature goes above 4.4°C, and recedes after the temperature exceeds 25°C. Kitchen Storage: Some onions you'll want to use for eating immediately they've finished growing. Onions don't keep well in the refrigerator because the atmosphere has a high moisture content. A couple of other places are not so good, such as next to spuds, as they are high moisture vegetables, as well as releasing a ripening gas that causes onions to go soft. Storing onions in an airy pantry or cupboard, terracotta storage jar, cardboard box, shaded veggie bin or similar should give you 3 weeks or so of unspoilt onions. Some varieties such as the sweet ones have more moisture content and naturally are not long storers. Onion Pest and Diseases — Forewarned is forearmed. Have a read now so you are ready for anything. Extra Secrets and Tips on How to Grow Onions — Get the edge for super successful onion growing. List of Vegetables — Now you are an expert on growing onions, check out more vegetables to grow.